It has been 3 months since John Colvin’s fatal-hit-and-run in Emerald Bay. In an email from his wife Joan I’ve learned she still has no accident report from the LBPD. Following three separate motorcades, last month the LBPD reminded us again of our dedication to the sculpture memorial “Eternal Legacy” for fallen motor officer Jon Coutchie. A search for ‘John Colvin’ gets 6 hits, a search for ‘Jon Coutchie’ gets 25 hits at the on-line newspaper Laguna Beach Independent. 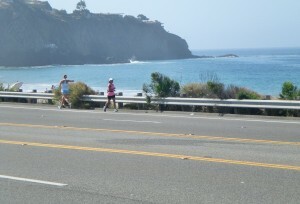 Remember these events when you ride your bicycle in Laguna Beach. Another cover-up is almost complete, residents will forget, all’s well in the feifdom. We don’t know who the kid is except by a newspaper account, 19yo. I learned separately the car has a Emerald Cove sticker on it- that’s a gated community within a gated community. The kid likely lives there. The cops remain tight-lipped. The investigating officer is Sargent Louise Callus LBPD. Joan is in NYC, her message was short, her meaning was “don’t call us we’ll call you” so I’ll not press her for details. When we know more, we’ll post it here. 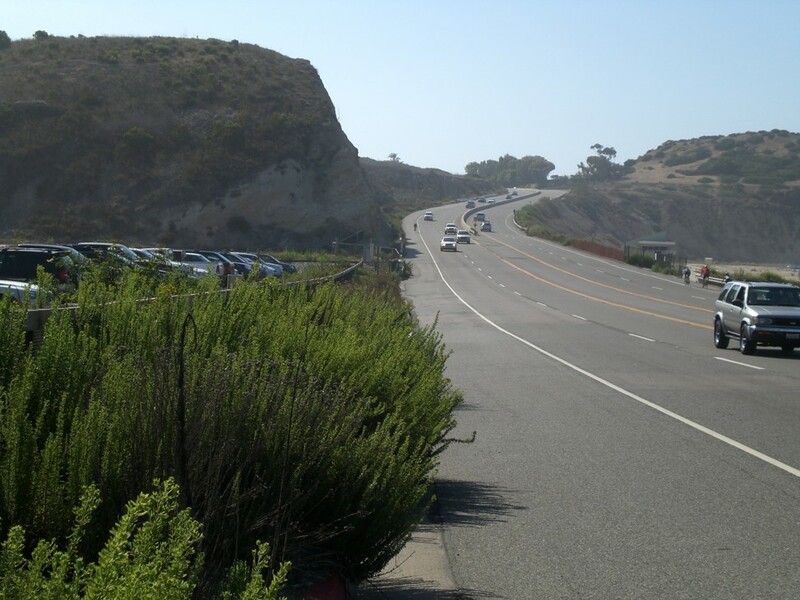 Yesterday an article in the Laguna Beach Patch asked, “Is It Impossible to Have a Truly Bike and Pedestrian-Friendly Laguna?” Our answer is obviously “no”, not only because it is possible, but due to the necessity of all road users getting a fair shake, and to increase safety, a lot of work on the part of all stakeholders looms ahead despite an online petition (with 265 signatures) to: Create Safe Bike Lanes In Laguna Beach, and Caltrans DD64 directing the agency to implement Complete Streets, the drive and passion of the public is needed to tell their city leaders what priorities are needed, and how funding may be secured and spent. 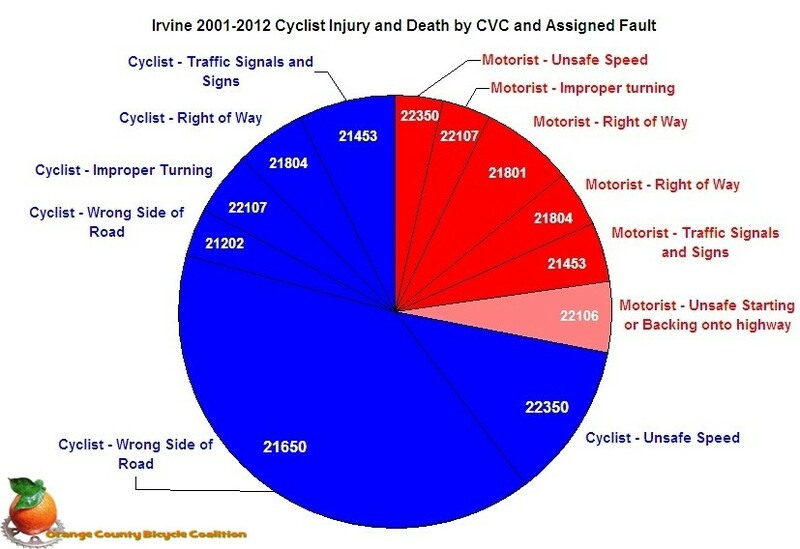 Earlier we posted a Slice of Irvine which showed a busy pie chart of cyclist injury and death. 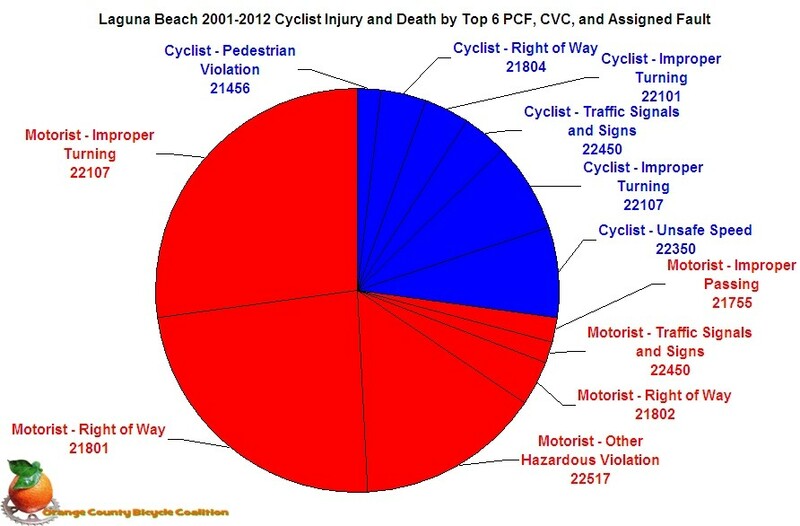 At tonight’s workshop hosted by Transition Laguna Beach, we will present a similar chart for Laguna Beach. Of note is the difference between the two locales of the assigned fault to cyclists. Does this indicate a bias on the reporting agency? 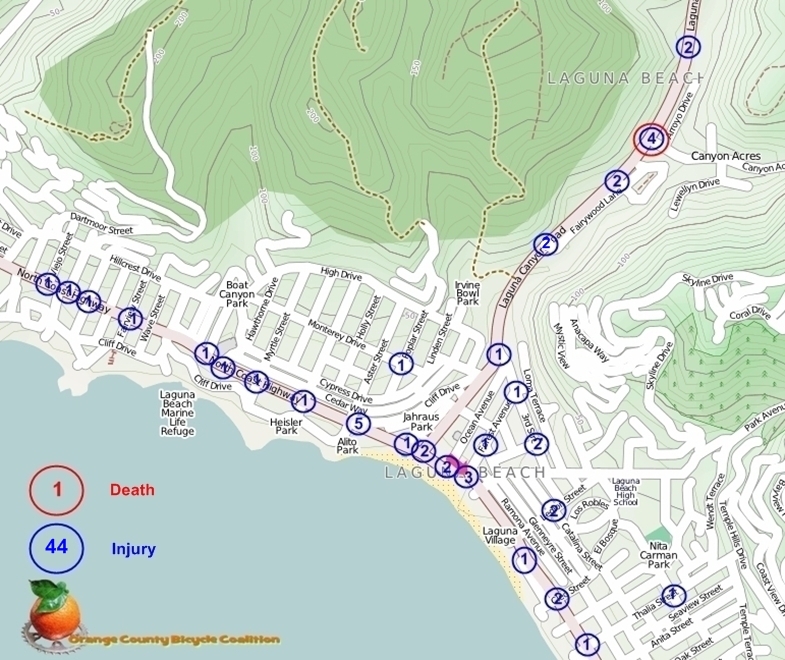 The graphic on the left depicts the number of cyclists injured or killed in Laguna Beach from 2001. And now for the pie chart! There is plenty to talk about, especially with an eye to the future, so join us this Sept. 13, from 7-9 p.m. at the Neighborhood Congregational Church’s Bridge Hall, at 340 St. Anne’s Dr. Here we have 3 riders going up and 1 coming down. From the previous high speed down-hill, it is always fun to see how far your momentum will take you up the hill before the incline has you searching for just the right gear to carry you over the top. With the lifeguard station just to the right, keep an eye for vehicles entering and leaving the highway. 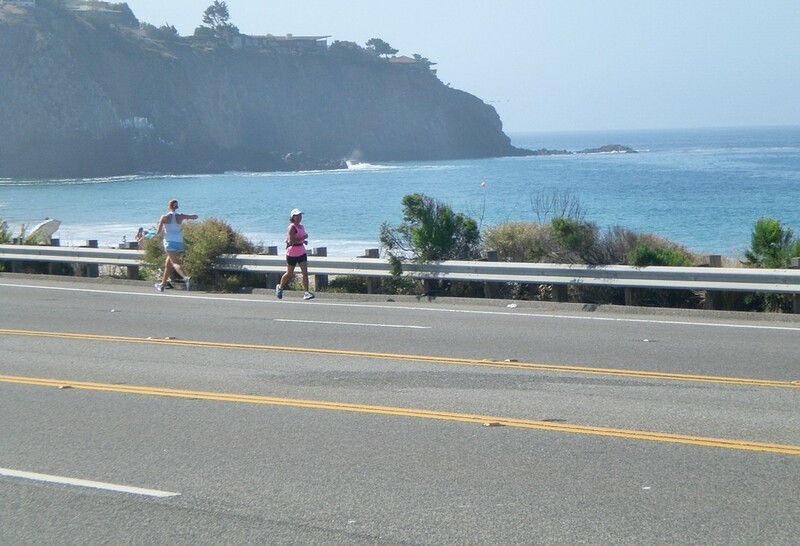 Although traffic moves very fast in this area, the shoulder is just wide enough to get up to speed and set a new pr from the base to the sign welcoming you to Laguna Beach. Unless the shoulder is filled with runners. 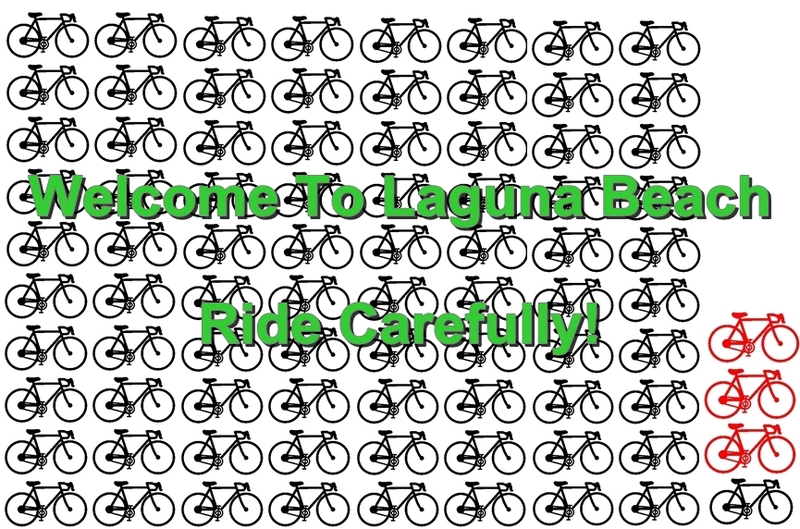 An agenda item (#14) on the Laguna Beach City Council meeting on August 07, 2012 at 6:00 PM recommends installing half the previously recommended number of bike racks with hoop and wave style bike racks to increase the availability of bike racks within the city. Currently throughout the city there are racks for 40 bicycles in the downtown area and 47 at City parks. Some areas not eligible for racks for various reasons are the Post Office Mall, the Sawdust entrance, Albertson’s Shopping Center, and Starbucks just to name a few. If the CityCouncil approves the planned (and funded) recommendation, 29 new racks will be installed and monitored for usage to determine the next year’s budget outlay for additional racks. While increasing bike racks in Laguna Beach is great news, given the artistic talent readily available within the city, couldn’t Laguna Beach commission artistic and functional bike racks like Carlsbad and Long Beach? Let the Council know your opinion at the meeting tomorrow evening! Some businesses in Long Beach even ask for “themed” bike racks to be installed because they recognize the value of attracting cycling customers. Dog bones, coffee cups, hearts, and guitars are just some of the designs possible (and in use) in Long Beach. Laguna Beach deserves better than the tired, boring, and (in the case of the wave design) mis-functional bike racks. Creative bike racks balance function and form to create an inviting atmosphere and lend character to a business, village, or city. View or download the staff report (pdf) here. Photos link to source articles.